Situations that appear serene and balanced on the surface can hide a deep undercurrent of suppressed tension and imbalance. In most instances, the state of imbalance however doesn't emerge suddenly but develops over time. If we're conscious of the unfolding pattern, we'd have spotted the eventual outcome long before it transpires. A losing business can continue operating provided it has enough cash or, more likely, credit to sustain itself. It's only when banks and creditors refuse to extend further credit that leads to its collapse. That usually occurs when its debt to capital leverage has reached a dangerous level. The root cause of the collapse however is not the extreme level of its indebtedness but its loss-making operation. A glimpse of a firm's accounting balance sheet, that is, its statement of assets and liabilities, can reveal a distressing situation if most of its capital assets are financed by external short-term borrowings. Likewise, for a national economy, a similar account of its assets and liabilities can also disclose a worrying condition if the assets are held by a small, prosperous group that's totally detached from the bigger but wretched group bearing the liabilities. Other types of imbalance also exist in a national economy. For example, the exchange rate can become too expensive leaving the populace unable to produce and dependent on imported goods. Also, the power of technology can hasten the decline in middle class income, leaving a small minority at the top able to afford spending. These imbalances are the reason why an economy stops producing. By the time an imbalance makes itself felt, the economy would've already been in serious trouble. Politicians and policymakers are naively exhorting their countrymen to be more productive as if this economic crisis is all about failing to compete. Improving productivity is a slow process that's ill-suited as a crisis solution. Moreover, it usually calls for major investment that's unlikely to be forthcoming when investors are fleeing the country. Any turnaround effort must therefore first rectify the debt imbalance through debt write-offs. If the debts are owed between residents of the country, a high inflation rate performs the same function as debt write-offs. An exchange rate imbalance can be addressed through a currency devaluation. The last imbalance, the technological edge, has no fix except for a new Kondratieff wave that will obsolete the existing technology. Because of this, the first two imbalances will keep on recurring even after they have been snuffed out. It also explains why an economic depression is inevitable. How do we spot an imbalance in a country's balance sheet? First, we need to understand the assets and liabilities that need to be monitored. What we mean by assets are financial assets, the numbers in virtual bits and bytes stored digitally on the servers of financial institutions. They are not the tangible, physical assets that can be touched and seen, the values of which are unimportant since they move in sync with the ups and downs in the credit quantity. Liabilities, on the other hand, are always financial. In modern times, you don't owe others in terms of physical things. Even if you do, they'll be translated into financial terms. As assets and liabilities are just opposite sides of the same coin, we only need to monitor one, which in this case is liabilities, being the more convenient because the Fed publishes complete data on credit in its quarterly Flow of Funds Accounts. If you recall the cash flow of a national economy in an earlier post, the cash flow is actually the debt movement of the economy. The balance sheet on the other hand is a snapshot status of liabilities and assets. As on the cash flow, we're interested only in debts on the balance sheet. So in effect, with the GDP — this being the economy's income statement — and the debt flow, you can assess the strength and portend the future of any economy. These are the speedometer and tachometer of the economy. Extending the car meter analogy further, you can add the house price index and the labour force participation rate (LFPR) charts to represent the temperature and fuel gauges. Unlike a car which breaks down from overheating, the global economy is grinding to a halt because of overcooling. The world economy doesn't have much problem with overheating because mankind's ingenuity will see to the expansion of capacity to meet any excess demand. Let's bring on the latest charts to see how much further the world economy would have to struggle before succumbing to the forces of the economic depression. We begin with the US GDP which has just declared its third quarter figures for 2012. There's only one driver of growth: personal consumption. Both government spending and investment haven't shown any improvement. In fact, investment spending would have sagged had not residential investment, again incurred by consumers, risen. Regardless, home prices have much further to fall, despite the recent price uptick. In the lead to an economic depression, you'll come across many instances of the dead cat bounce. The GDP growth since the 2009 recession also has been wriggling within a narrow band (blue line) with no sign of breaking out. With no more trillion dollar deficit in the pipeline, we can be sure where the GDP growth is headed in the coming quarters. It appears from the first chart that the consumers are the driver of the GDP growth but the GDP components as computed aren't a true reflection of the real driver of growth because a significant proportion of government spending and business spending would end up as personal spending. In addition, the GDP records only spending and ignores any wealth destruction, such as loan write-offs — every time a loan is written-off, an equivalent amount of financial asset disappears. 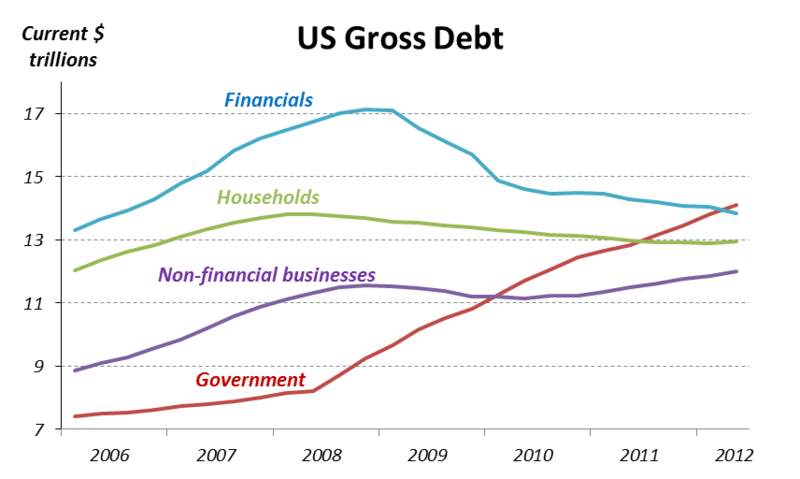 To get the true picture, we need the debt chart, at left, updated only up to the second quarter 2012. A different picture now emerges. The government debt is on a relentless increase because of Obama deficits. 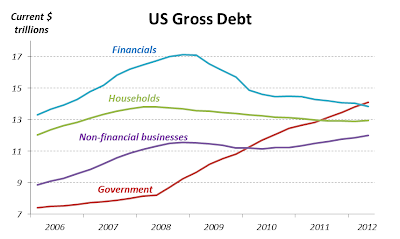 But the household debt is trending south together with that of the financials. Aside from the massive government spending, the major reason for the escalation of government debt is that it cannot be written off whereas household debt is still suffering from write-offs with much more expected in the future. How do you explain the inconsistency between the household debt on the debt chart and personal consumption on the GDP chart? There can be only one plausible explanation: two groups of consumers are experiencing two diverging patterns, one flourishing from government spending spillovers and the other languishing under the burden of debts. Technological progress and globalisation also reward the former but assail the latter. Bloomberg has a revealing chart below that sums up the fortunes and misfortunes of the two groups. The pattern fits the 80:20 rule, the top 20% enjoying and the bottom 80% suffering. This pattern is spreading worldwide to any country that exposes itself to the ravages of globalisation. 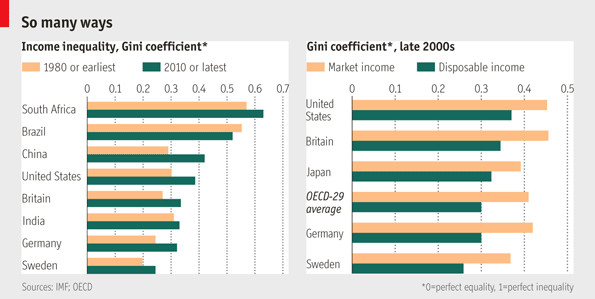 This increasingly lopsided sharing of wealth is reflected in the worsening Gini coefficient, a measure of inequality, as shown on the The Economist chart below. But more ominous is China's Gini coefficient which has deteriorated at the fastest pace since 1980. Heralded by many as the next engine of growth, doesn't China look more likely to be a drag on global economic growth?